Behold!! the DOOM 2016 of 2017! A seemingly improbable mashup of Nintendo’s Mario with Ubisoft’s Rabbids that went from laughingstock to object of extreme interest to improbably awesome game in mere months. I think some not-insubstantial credit for that belongs to a certain composer’s work. 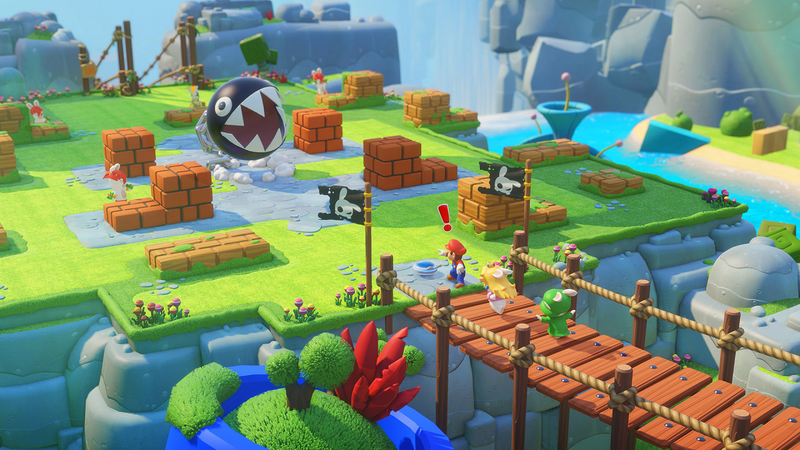 One of the most fundamental ingredients to the secret sauce is how this game is a glorious stew of elements and influences that go even deeper than simply Mario and Rabbids characters thrown together. On the more obvious front, the turn-based tactical RPG battles, which form the backbone of the gameplay, pull heavily from the XCOM series. Then there is the music which, courtesy of longtime composer Grant Kirkhope, adds so much warm 90's Nintendo flair to the proceedings. Grant’s initial claim to fame was as one of Rare’s chief game composers, and his tenure included much of their most recognized and beloved games for the game system. He had a hand in the music for FPS classics GoldenEye 007 and Perfect Dark. He was the sole composer for Donkey Kong 64, as well as...oh, nothing too big, just one of the most formative games in the 3D platformer canon, Banjo-Kazooie. I think it’s in that way that it was especially meaningful for him, of all people, to be chosen to helm the music for Mario + Rabbids Kingdom Battle. One common tack I’ve often seen from people taking issue with the soundtrack—mostly comment sections for the likes of Kotaku—is that it doesn’t sound distinctly “Mario” enough. And they’re not wrong! But I think that criticism misses the true and more worthwhile purpose of his work here. Like, for one, let it not be lost on anyone that the soundtrack for this game is fantastic; it makes playing the game such a cheery experience, and it’s practically my favorite video game score of the year. Deeper than that, this score doesn’t seem like it aims to sound like it belongs in a Mario game, but rather actually tries to evoke the feel of Nintendo 64-era Rare games. On that count, I think Grant Kirkhope nails it on the head. Which is especially evident in a song like “Ziggies!”, one of the battle themes, and one of my favorite pieces from the game. The opening melody is pure triumphantly affirming joy, and everything moves at a quick pace appropriate for a showdown. Then the latter half, starting with a flute taking the lead, exudes some especially strong Banjo-Kazooie vibes, and gets even stronger with the transition to a more suspenseful mood. It could just be highly specific to me, being reared on the N64 as a tiny kid, but hearing this puts me in such a good mood.